5 days ago we, Tandin, Sherub, Tho and me rented a car and a driver to join Dr Saamdu and Pema in Bumthang. 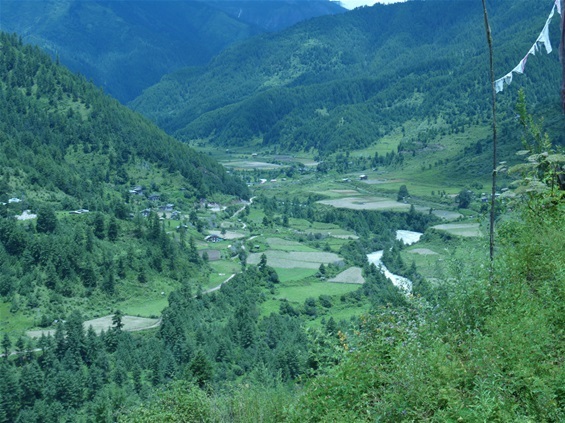 central Bhutan, future place of the GNH Center. We met Dr Saamduu and his assistant Pema in Jakar and from there we rode on the most adventurous road into the most remote valley, actually the last inhabited valley, Chokor valley. I thought we would not make it! The road was partly totally covered under muddy landslides. It took us over one hour for 20km! Luckily we had 4 wheel drive cars and good drivers! And in this valley we stayed in the LAST house…the road stops there! A little bit further there is only an army camp as we are near the chinese boarder…from there on only mountains, mountains, mountains, eagles, bears, tigers, lepards…. We stayed in a “homestay” at 2900m with a most charming Bhutanese family, I’ll write about them later as they made quite an impression on me! Nature is still all powerful there, the trees, plants, rivers, stones still live there quite undisturbed and untouched!